……to celebrate 16 years of our online presence – get 20% off during our Annual Sale on all cross-point kits from November 26 through ALL of December 2012. Now is the time to stock up on kits for the months to come and, please, add cross-point kits to your Christmas wish list! Another year has gone by. I added 3 new patterns (new TRIANGLES shown above) to the cross-point™ collection, many new colorways, new sizes to existing patterns, and a number of upholstery designs. If you missed the notice last year at this time, I redesigned the cross-point™ website (after a year of online tutorials and local college courses to learn Dreamweaver! ), added this blog, a business Facebook page, and set up a quarterly e-newsletter. Our new shopping cart with PayPal – still the safest service available for credit card processing – makes it easy and convenient to order one of our kits. During our sale, PayPal will initially bill the full retail price and we issue the 20% discount directly to your credit card the same day. You also have the option to place an order by telephone to 828-628-2743, between the hours of 9 to 5PM, Eastern Standard Time, Monday to Friday. 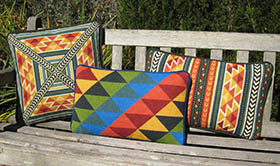 The three new designs include one super “EASY” (TRIANGLES) in 2 sizes and 2 versions, one pattern anyone can stitch with a bit of experience (BALOUCH STRIPE), and one pattern for experienced stitchers (KILIM II). All are available in a multitude of colorways to fit any number of color schemes. Please visit the website to see all new patterns, colors and size options. To all of you who signed up for the e-newsletter – thank you! And to all of you, a sincere THANK YOU- I am grateful for each and every order received throughout the last 16 years. I look forward to more designing, more chatting with you on the phone, as well as your comments, questions and suggestions on the blog. Occasionally I add comments on the cross-point™ Facebook page but, oh I know, I could do this more often but I only do so now when I have something new to share. Please tell all your stitching friends about us; put cross-point kits on your wishlists for Birthdays, Mother’s Day, Christmas, any day….It is, after all, thanks to you that we are still around. This entry was posted in cross-point kits, new cross-point patterns and tagged christmas wish list, credit card processing, cross stitch kits, crosspoint kits, Kilim stitching patterns, Meadow & Field colors, Morocco Stripe Pattern, needlepoint kits, new patterns, Sieglinde Anderson, upholstery designs. Bookmark the permalink.